Known mainly for his colorful paintings and abstracted paper cut-outs, Henri Matisse is a name familiar to art enthusiasts and casual museum-goers alike. Perhaps not as well-known is Matisse’s deep and life-long connection to textiles and fabrics. When The Center recently encountered an example of one of the artist's textile designs, we knew there must be a story behind it. Though most would associate him with the bright colors and sunshine of the South of France, Matisse was actually raised in Bohain, a small town in the North, which though cloudy and lacking in any publicly available art, was home to a flourishing textile industry. As Hilary Spurling writes in the catalog for a 2004 exhibition featuring Matisse's textiles, “the only available outlet for [his] nascent visual imagination came from the sumptuous, shining, multicoloured silks produced in weaver’s cottages and workshops all over Bohain.” Though eager to leave behind what he deemed the "stuffy North", textiles were in Matisse's blood and continued to serve as a source of inspiration both in subject and technique for much of his artistic career. Throughout most of his life, Matisse traveled with what he dubbed his “bibliothèque de travail,” or "traveling library". This was a collection of scraps and assorted fabrics which he used both as a subject and source of inspiration for many of his paintings. 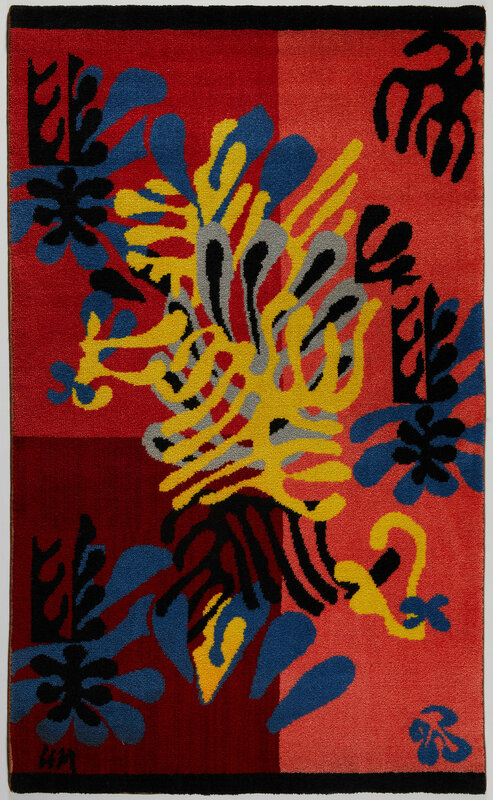 As such, it comes as no surprise that in 1949-1951, Matisse took his textile-based inspirations one step further and designed a series of rugs. The rugs were produced by Alexander Smith & Sons Co., and No. 370 of the limited edition of 500 was brought to The Center by a private client. Named after the flowering trees that populate the Cote D’Azur, the Mimosa rug series was the only art carpet Matisse himself designed and authorized. The artist's intention was for the rugs to be hung as tapestries. The whimsical shapes overlap and interplay, giving a sense of dimensionality and playfulness much like Matisse’s paper cut-outs. This particular rug had recently been gifted to our client by her aunt and uncle, who had amassed a collection of primarily Surreal and German Expressionist art over 60 years ago. “They were aware of the production of the Matisse rugs by the Alexander Smith Carpet Company, so they went to one of the larger department stores in Pittsburgh and had them order the rug,” our client explained. Upon examination of the rug, our conservators discovered the piece was in soiled condition and showed signs of moth infestation. The piece had previously been displayed using nails through the body of the textile, which resulted in scalloping along the top edge. There was a signature panel present on the back of the textile at the lower right corner; the panel was heavily stained with losses to the fabric. Our conservators began their treatment by addressing the moth infestation using the appropriate freezing, fumigation, and steaming techniques. The piece was then vacuumed using light suction through a screen into a HEPA vacuum. Next, the colors were tested for stability. Once the colors were confirmed to be stable enough to wet wash the piece, the work was washed, blocked, and dried. The signature panel was removed, wet washed, and lined. The losses in the panel were then secured and it was reattached to the rug. To create a system for our client to safely display the rug, our Textile Conservator first lined the verso of the piece with a full, conservation-grade cotton lining to create additional support. For display purposes, a Velcro strip was then added to the top of the verso of the piece, and a separate, corresponding mounting bar for the wall was fabricated. The work was then returned to our client to hang proudly in her home, where the unique history behind it can live on for years to come. Spurling, Hilary. “Material World: Matisse, His Art and His Textiles,” in Matisse, His Art and His Textiles: The Fabric of Dreams. London: Royal Academy of Arts, 2004.